The Majesty of the People links emerging Romantic ideas about the role of the writer to the ambivalence of the concept of popular sovereignty. 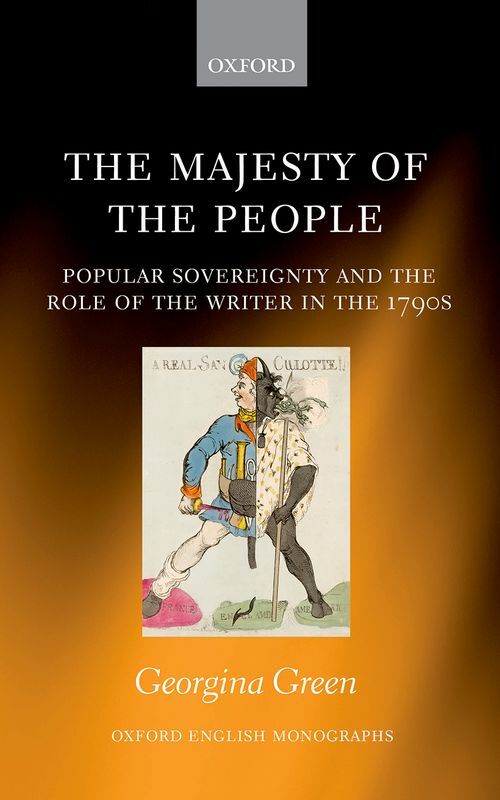 By closely examining how theories about the role of the intellectual or the writer are developed as part of the 1790s' contestation of the concept of the majesty of the people, Georgina Green provides a coherent account of debates about popular sovereignty, and contributes to understanding of authorship and the rise of 'culture' in this period. Part one, 'the political existence of the people', shows how the history of ideas about the political role of the people in the eighteenth century meant there was a role for writers and organisations who could challenge the invisibility of the 'people out of doors'. Part two, 'the sovereignty of justice' shows how this urge to give the people a tangible form was moderated by the tension between the sovereignty of will and the sovereignty of justice, a tension foregrounded by Revolutionary France and addressed in the writing of Thomas Paine, Helen Maria Williams, and William Godwin. Part three analyses how this potential tension between popular sovereignty and absolute values such as reason, justice or divinity pressurizes Wordsworth and Coleridge's conception of their role as writers. These enquiries demonstrate the impact of the idea of the Majesty of the People in the 1790s and in emerging conceptions of the role of culture in society. Georgina Green is a research fellow at the University of York, currently working on the Leverhulme funded project 'Networks of Improvement 1760-1840'.